This morning I walked into town before Norm’s car departed for the airport and got a “grande” latte at Costa. It wasn’t bad, but it isn’t Starbucks (* subsequent note, during the shopping trip mentioned below, a Starbucks was sighted and duly noted for tomorrow morning). There was only one other guy in the coffee shop this morning, indicating either the English aren’t up yet or they are not coffee drinkers. I suspect the latter since this place opened at 7:00 am and everything else seems to open at 9:00. Well, as David accurately predicted yesterday, Norm, Robert and I arrived at the airport to about 800 overcast. Clearly not having enough last night at dinner, Robert had a truly impressive breakfast (eggs, sausage, English bacon, hash browns, beans, mushrooms and toast) and I had the child’s breakfast with tea that came in at a whopping $7 USD, as opposed to the now-famous $24.68 hotel breakfast-of-choice of our team manager. 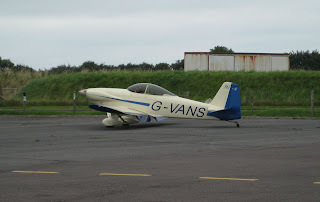 Here at the airport this morning, only the Tiger Moth is flying, as well as four skydivers that jumped from a King Air. Jeff and I are certain it was a through-the-clouds jump as 800-foot overcast doesn’t generally bode well in skydiving. 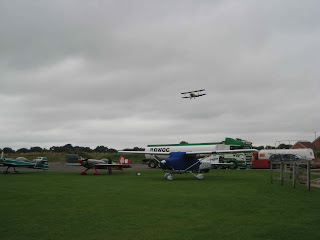 I took this photo that captures three important elements: the low ceiling, the Tiger Moth on final and the truck bringing avgas and subsequently airport revenue that we hope offsets the noise complaints. Debby went shopping this morning for CAP-worthy tennis shoes with success. Len arrived on site with Hubie’s 200-lb parts/tool box and Goody’s suitcase. Goody had has the same clothes for many days and we all were quite happy to see him reacquainted with his suitcase. 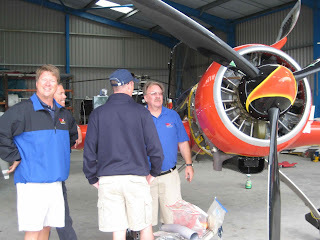 Len will go to work helping Debby fit better in Hanspeter’s CAP and Hubie completely overhaul his Sukhoi. By the time they are done, it could have an additional 400 hp, 700 degree-per-second roll rate and a new paint job, but look like a John Deere tractor. 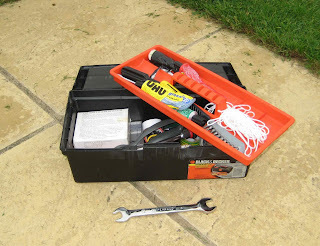 Hubie's toolbox for the Sukhoi. For scale, check out the exhaust pieces next to the box. 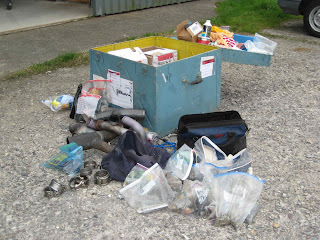 A typical toolbox for a Lycoming-powered aircraft. Note the wrench for scale. Toolbox courtesy of Hanspeter Roehner, the Swiss CAP driver and renter to Debby. Hubie, Goody, Jeff and Len contemplate the Sukhoi; well Hubie maybe not so much in this shot. After a fabulous lunch of chips and a tuna mayonnaise sandwich (no butter today but on brown bread) shared with Norm and Debby (we are all feeling a bit full and fat), we retreated back to the FBO to digest our lunch and call each other on Skype despite the fact we were sitting next to each other. Bored people will do strange things. Right after lunch, this RV-4 was in the run-up area. What a great “G” number. Norm and I cut out early and went shopping for airplane cleaning supplies for Debby and I, sand paper to scruff up the heels on Deb’s new flying shoes, and baby powder for less friction on the heel plates in the CAP and the Edge. I can’t wait until Paul (and Hanspeter) gets a whiff of the new scent in his plane.